Shop Talk Thursday: NaNoWriMo Here I Come! I know you’ve seen about a bazillion posts about NaNo by now. I mean, it seems that every writer who’s a writer is doing it this year (which by the way, is awesome). No really, just think of the support! I know that NaNoWriMo is already all about support but when you have people like Beth Revis and Sarah J Maas willing to start a forum of “Ask a Published Author“, you know it’s going to be a good month. I’m not kidding, bookmark that forum. It will come in handy. The main reason why I was struggling on whether or not I was going to do NaNoWriMo is because I already have a project that I’m working on. This WIP is something I’ve wanted to write for a while and I feel like I can finally do it justice. Yes, you’ve heard it all before but guys, I’m super beyond excited! (and I hope you will be too when you read it) But I digress. A couple of weeks back, I wrote this completely random scene that didn’t seem to fit anywhere in my current projects. So I saved it, leaving it on my desktop for another time. When my CP and I were talking about NaNo (and the agonizing choice I had to make) I kept coming back to that scene. I realized there is a story there that I wanted to tell and it’s about time I tell it. CP and I brainstormed a little, and guys, GUYS, it’s going to be amazing. Yes, I know it’s 50K in a month. Yes, I know it’s craziness of a mess on paper after the month of constant writing. But I’m excited! (also, just wait till you see what CP has in store for you, because hello awesome!) I’m really committing myself to this for November. Come rain or high water, I want to give it my best shot and see where I stand. This does mean walking away from my current WIP for a bit, but I honestly think it may even be good for me. 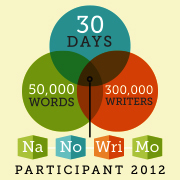 So what do you see wonderful people, anyone up for NaNoWriMo with me? Here’s a link to my profile: Valia Lind (let’s be buddies).